Recently Microsoft gave the first view to the update of Skype program. Well, it all sounds like the giant corporation decided to turn the Skype into something bigger. According to the Microsoft plans, Skype will communicate with other apps. The program that was created to connect people around the world still remains very popular. Millions of users all over the World have the conversation through the Skype. It is not only the way for family connections but also the chance for free conferences at work, etc. Now, Microsoft wants to change the interface of this program into something bigger. The corporation wants to involve other applications, like Cortana, for example, into the work. Cortana will do its job of virtual assistant and probably will help to phone users with the Skype connection. Nowadays user can download as many apps as he wants on the phone. 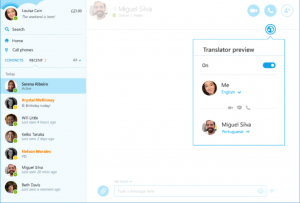 Microsoft is working on adding the third class apps to the Skype. The main idea is to create one general platform, which probably will be Skype, and gather all small apps inside. It will be cold Skype bots, and will help to integrate small programs into Skype. Developers in Microsoft Company want to give users functions of shopping, travel managing, different entertainment views via the Skype. It will be possible thanks to the virtual apps. Bots will be able to communicate with other apps in the same way as users and to connect the information on the Microsoft’s platform. According to Satya Nadella, the CEO in Microsoft, they are ready to give the world simple way to communicate and to surf the net. They understand that people do not have time to read dozens of webpages for information that is why they will need the help of bots.